For race specifics, view our Featured Races page. Can you tell us a bit about this year’s event? Our title sponsor has changed; it’s now Town Bank. We are seriously excited about this since they have a great reach in the Milwaukee/Waukesha areas and hopefully this will expand our marketing efforts. There is just a slight change to the course in order to avoid a bottleneck at the start like we had last year, but other than that, it’s still the most beautiful 5k course in the area! About how many participants are you expecting this year? And what do you think makes Thanksgiving such a popular day to race? We are hoping to get to 1,000 participants this year. Last year we had almost 800 registered runners and walkers so it’s not out of the question. 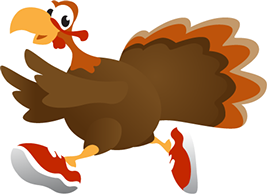 Thanksgiving, more than any other holiday, seems to be steeped with tradition and that is evident with these turkey trots. There are so many families that come and participate together. It really is a special event. What should participants know about the course? It’s very scenic, mostly flat, and much of it is on or near the Fox River. Burlington is a special place and is the perfect setting for a Thanksgiving Day race. Can you tell us a bit about the team option? We are encouraging people to form teams and then we will take the combined time for the top three runners from each team to determine the fastest ones. The top three teams will get special awards. What type of awards will be given out at the end of the race? We do age-group awards in 5-year increments with each getting a medal. We give a cool turkey trophy to the top three male and female overall runners, and we have a gigantic trophy that is given to the runner finishing in the middle of the pack. It’s so big that last year it barely fit in the winner’s car. Are there any top contenders for overall male and female this year? At this point it’s too early to tell, but my guess is that last year’s champions James Koceja and Monica Schoeneck will be back to defend. Who is this year’s non-profit partner? Our charity partner is Love, Inc. again this year. This place is truly amazing; it helps so many people in Western Racine County with its food pantry, meal site and dozens of other programs. We will be raising money for the food pantry. Can you tell us a bit about the raffle and how runners/walkers can earn raffle tickets? After the race, we are raffling off turkeys (gift certificates for them, actually) and pies … lots of pies! For each non-perishable food item you bring, you receive one raffle ticket (maximum of 10). It’s a fun way to get donations for the food pantry. Thanks for all the great info, Chris! 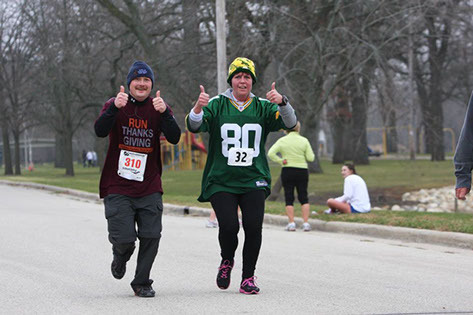 MKE Runners – who would like to win an entry to this year’s Town Bank Turkey Trot? Best of luck to all who enter. We’ll announce the winner on Thursday, Oct. 23. 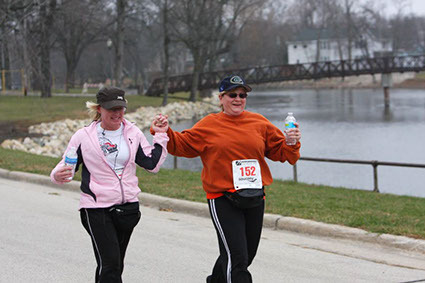 This entry was posted in Race Previews and tagged Giveaway, Milwaukee Races, Race Previews, Running in MKE, Town Bank Turkey Trot, Upcoming Events. Bookmark the permalink. ← Monster Run Race Entry Winner! I’ve always wanted to try a Thanksgiving morning race!! Looks like a fun time, I may have to make the trek to Burlington! Also a quick run that morning will let me eat more of my favorite…pumpkin pie!! !